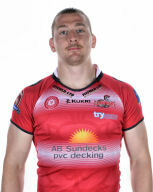 After joining Leigh on two-year full-time playing contract following his release from Salford Red Devils, Andrew was the LISA-sponsored player for 2015 when he was a regular in the pack. He began his professional career with St Helens, signing from the Blackbrook ARL club and made his first-team debut in February 2009. He went on to earn a regular first-team squad place during his four seasons at Saints, often playing off the bench. He featured in the Saints sides defeated in both the 2010 and 2011 Super League Grand Finals, playing alongside current Centurions team-mate Jake Emmitt in the first of those two finals. At the end of the 2012 season, having scored 13 tries in 67 games for Saints he joined Salford on a three-year contract. In his first season he made 28 appearances scoring four tries and in 2014 he scored four tries in nine games while also playing one game on loan with Barrow Raiders.